Did you know you can take your dog from the UK to France by ferry- and keep him in the cabin with you, instead of leaving him in the car?? I promise- it's absolutely true. As anyone who follows us on Facebook will know, I HATED the idea of leaving our little adventure puppy Mac in the car on the ferry from the UK to France. In fact, we were prepared to drive from Devon to the Eurotunnel and then back to the West coast of France (a one-way trip of around 700 miles)… all to avoid putting him through that. However, one of our lovely Facebook followers messaged me to let me know about the Brittany Ferries Pet-friendly cabins, where you can bring your pet onboard and he stays in your cabin overnight. There's even a special dog walking deck. Currently, the only route offered from the UK to France is from Portsmouth- Le Havre, (there are other routes down to Spain and I believe DFDS also have pet cabins across to Holland). Still, this Brittany Ferries pet-friendly cabin sounded absolutely perfect, so we booked it up for the very next week and off we went! 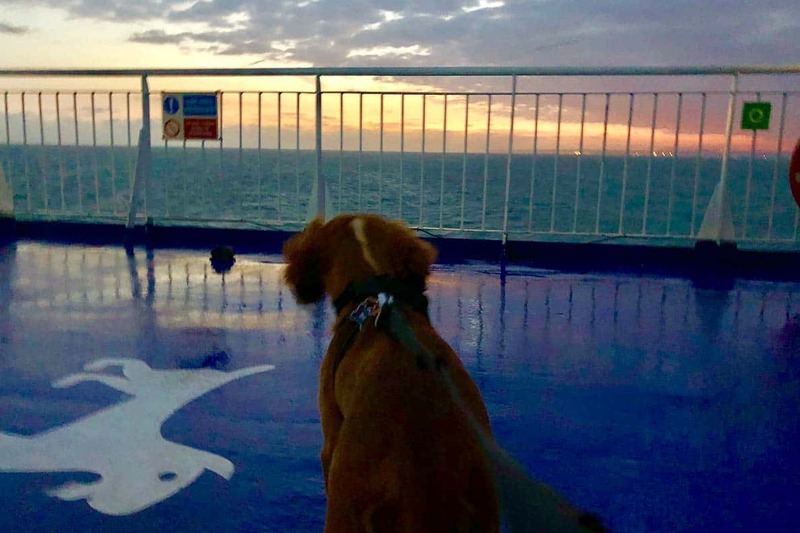 Here's everything you need to know about taking your dog France using a pet-friendly cabin with Brittany Ferries. Taking a Dog to France- how much does it cost? Taking a Dog to France by ferry in a Pet-Friendly cabin- is it worth it? Firstly, before you can leave the UK with your dog, you need to get a Pet Passport on the Pet Travel Scheme. We found this experience to be fairly straight-forward, but it wasn't very cheap. If you're looking to get a Pet Passport, you'll find this post helpful- it details the exact steps and timescales we needed to get injections done and the pet passport issued for our young puppy. Firstly, get him a comfortable travel crate which allows him to stand up and turn around, but not move too far. We use a collapsible crate in the car so we can take easily transfer it from car to Motorhome, and this worked well on the ferry (we didn't take it in the first time- big mistake for my night of sleep…. I didn't get any!!) I also LOVE this slanted crate from Ellie Bo- we have their ‘normal' crate and it's fantastic quality. How clever is this car travel one?!?! Brittany Ferries provides a collapsible food/ water bowl in their pet-friendly welcome pack… but I'd recommend taking your own, just in case they don't when you arrive! I love the ease of these- you can put food and water into them before you set off, so you don't have to worry about carrying loads of food bags onto the ferry with you! The top bowl is also water-tight, so you can keep in there as you travel; Genius! DO NOT PACK THE SQUEAKY TOYS!! Pretty pretty pretty please. Leave those in the car. Chew toys, antlers or anything which doesn't get them worked up and bounding around all over the place is good… I should know; we tried to contain an excitable cocker spaniel puppy!! Balls/ frisbees are a bad idea, especially on the poop deck (see below)- the railings are fairly wide and a ball is highly likely to go over the side. Now is not the time for a flimsy training lead or an extendable one which could break. There will be other dogs, weird smells and a serious drop overboard. I didn't let Mac anywhere near the railings as I'm fairly certain he could have squeezed through them if he decided to chase a seagull or something. We love this lead as the extra hook points make it easy to shorten/ lengthen the lead and keep an excitable and curious puppy close to us when necessary. The short answer is yes, but before you immediately close down this webpage in disgust, let me give you the longer answer. When you arrive at the port, the person on the check-in desk will ask to see the muzzle. TOP TIP– at least PRETEND like you've used it before. We still had ours in its packaging… I could feel the woman rolling her eyes at us!! You do NOT need to muzzle your dog at all until onboard the ferry, so while you're at the port waiting you can go for a walk/ wee without needing to put it on. Mac and his muzzle (boo!) on the poop deck while Mr WB hoses down after him. The first time you need the muzzle is when you get out of the car onboard the ferry. You'll be parked next to a specific door, which has a lift taking you straight up to the ‘Pet Deck'. You'll be with several other dogs (we had about 10 with us) and ALL of them were muzzled, except a tiny chihuahua who was held in her owner's arms the entire time. There were lots of Brittany Ferries staff members around who were checking everyone's behaviour. It is my opinion that they would insist on your dog wearing a muzzle at this point. ANOTHER TOP TIP: Do NOT wait until this moment to put a muzzle on your 4-month-old puppy for the first time. Not that WE would ever be so stupid you understand… yeah, right. Poor Mac HATED the muzzle (as do most dogs) and he looked so sad, it broke my heart to make him wear it. Having said that, it was on for 5 minutes. Tops. In the grand scheme of things, I'd much rather he was upset for 5 minutes while I'm there to cuddle and reassure him, then him being stuck on his own upset for hours. That's our opinion on the muzzling. Get one which goes on really quickly and doesn't need lots of fastening/ adjusting. Ours goes over his snout and clips behind his head. It's really hard to know which size to get, so a pet shop might be your best bet. For those who are interested, we used this one, which was really easy to adjust to fit Mac. The Brittany Ferries Pet-Friendly ferry cabins from the UK to France cost exactly the same amount as the normal cabins. I believe we paid £79 (each way) for an inside 4 berth. Be aware that breakfast is not included on the Portsmouth- Le Havre route. Also, you MUST make sure you book your dog onto the crossing, as well as booking the cabin. When you are filling in the details on the booking for adults/ children who are travelling, you'll find a small section below that asking how many pets you will be taking. Obviously, you can take a dog to France without booking a pet-friendly cabin- but you'll be leaving them in the car. They won't be allowed onboard the ferry with you. I think it was around £35 to add a dog onto the booking- which we thought was very reasonable! All the Pet-Friendly cabins are on one deck and are all very close to the lift and the Pet Deck, which is a specialised deck where you can walk your pet and get them to do their business. There's a bin to dispose of your poop bags and a hose is provided to wash down after them- PLEASE use it. Mac happily splashed his way through all sorts of unpleasantness and then proceeded to jump all over me… awesome. Not. Mac was understandably over-excited and disorientated. He wasn't entirely sure what he was supposed to be doing on that weird floor out in all that wind- even after watching several other dogs do their ‘thing'. It took a good 25 minutes to get anything out of him, so go prepared with a coat. I did NOT bring a coat with me and it was FREEZING- major lesson learnt. Mac watching the incredible sunrise as we cross from UK to France by ferry. The pet-friendly cabins on Brittany Ferries are exactly the same as any of the other cabins… with 2 notable exceptions. Firstly, there is no carpet anywhere. For obvious reasons. Secondly, Brittany Ferries provides a lovely welcome pack for your pooch, with a collapsible water/ food bowl, some poop bags (who thought I'd ever use that word so much on a blog!!) and a biscuit. We booked an inside cabin, for no real reason other than I thought the view out the window might freak Mac out a little. There were the usual 2 bunks below and 2 in the ceiling. If you want to know more about using Brittany Ferries to go to France, this video might be useful. There is no form of crate in the cabin, so you might prefer to bring your own. We didn't- and Mac greatly enjoyed being able to sleep on a human bed with his human (me!) I'll be honest, I was slightly less enthusiastic about the wet nose in my ear every 2 seconds or the snoring (HOW can such a cute, tiny puppy make so much noise??) and next time we'll definitely take his travel crate with us so we can all get a better night sleep. We had a surprisingly good night's sleep, with very few noises from any of the dogs onboard, and the next morning Mac happily went out to the Poop deck to relieve himself- it only took about 15 minutes this time and yep, I was FREEZING again- really wish I'd bought that coat!! None of the dogs were wearing muzzles at all this morning, so neither did we, although we did follow another owner's advice and clip it around his neck so it hung on his back… just in case. Pets are not allowed in the restaurant or anywhere else onboard the ship, so you can either take it in turns to go get breakfast, or leave your dog alone in the cabin. I would love to have chosen option 2, but I know he would have howled the place down and disturbed everyone else, so we went for option 3- I went down and grabbed bacon, sausages and bread rolls, along with tea & coffee… and carried them back up to the cabin. I have no idea if this is allowed or not, but nobody stopped me so we enjoyed a lovely breakfast in our cabin with a fairly contented puppy. Mac loving sleeping with his humans! If you're used to travelling to France on a ferry, the next bit is a little different from what you might be used to. Instead of having to leave your cabin 30 minutes before docking, you actually have to wait in your cabin until an announcement is made asking all Pet Owners to return to their cars. In practice, we discovered many pet owners went down to the car deck with their pets early and waited outside until the doors are opened. No muzzles were worn (I think everyone agreed- what are they going to do?) and the dogs played happily together for about 10 minutes. The actual announcement didn't come until a few minutes AFTER the doors to the car deck had opened… so I'm glad we didn't wait for it otherwise it would have been a bit of a rush. Once off the ferry, you need to show your passport at Passport Control to enter France. They didn't want to see Mac or his passport at all- they didn't seem in the slightest bit interested. One quick swipe of our human passports, and we were set free into the wilds of France. Absolutely! I should point out that we have never taken a dog to France any other way, but we're so happy with how relaxed we and Mac were during the experience. Apart from being FROZEN on the poop deck, none of us were ever worried and he wasn't separated from us once. There were no kennels or cages and (apart from the small time he had to wear a muzzle) he was totally calm about the whole thing- pretty amazing for a 4-month-old! The proof is in the pudding, as they say- we have now booked our next 3 trips to France and they are ALL using the Pet-friendly cabins onboard Brittany Ferries. I'm also pleased to announce that more cabins are becoming available- Portsmouth- Caen is starting in February 2019 and other routes should become available later in the summer. Brittany Ferries predict over 100,000 dogs will sail with them during 2018! BOOK EARLY if you want to travel in school holidays- these book up ridiculously quickly and for good reason; it's an excellent way to take your dog to France. Have you ever tried a pet-friendly cabin with Brittany Ferries or any other company? What did you think of the service?? Let me know below- I'd love to hear your experience.